Want to know when your phone will become your flexible friend? Will pliable displays ever take off? Let's face it: smartphone screens are getting a little boring. Apart from going closer to the edge of the bezel, it's all just increasingly larger displays in the same rectangular shape, with most attempts to deviate from this form factor failing. But what if we didn't have to put up with that? What if a radical new way of looking at our smartphone could mean we completely change the way we use our smartphones and tablets? 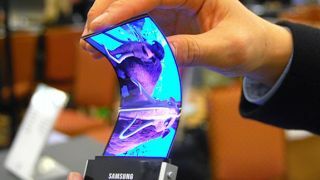 Flexible displays could do just that, and it's a technology that could be worth billions in just over half a decade. The second you mention flexible displays, most people turn off. They don't see the point in being able to bend your phone - and if that was all that flexible displays allowed, they'd have a point. But imagine if your smartphone could expand to tablet size, or you could wear a curved display on your wrist. Many people already know that flexible screens can be rolled or even folded, but more importantly they also offer much greater durability. A study by warranty provider Square Trade suggested that iPhone and Android device owners in the UK spent £1.2 billion on repairs between 2007 and 2012, and the most common cause of damage was accidental drops. While traditional glass touchscreens shatter and scratch, flexible displays can survive similar falls unscathed. The technology dates back to the 70s, when research company Xerox PARC produced the first flexible e-paper display. Billions of pounds have been sunk into the research and development of flexible displays since then, with limited results. Cambridge-based Plastic Logic showed off a concept newspaper that could be rolled up and put in a bag around seven years ago, but the technology has struggled to get off the ground. At the same time Polymer Vision, a company spun out of the Philips R&D lab in Eindhoven, tried to release a folding e-ink display, but couldn't get to the economy of scale needed - plus, the company told us, it was hard to convince people that their new device wasn't horrendously brittle. Thankfully in the last couple of years we've seen a flurry of prototypes heralding the arrival of this technology on the consumer electronics scene, meaning we could get our hands on the new wave of devices in the not-too-distant future. A recent report from Visiongain suggested "the global flexible display screens market will reach US$260.3 million" this year, but expects it to be the "benchmark technology for mobile devices" by 2018. An IHS report from early June is also optimistic about the future of flexible displays suggesting that worldwide shipments will climb to "792 million units in 2020, up from 3.2 million in 2013", taking market revenue to around US$41.3 billion, although other reports are more circumspective, suggesting that the market will only be worth $3.2 billion by 2017. The numbers are still very much up for debate, as we're not even at the product stage yet. However, prototypes for flexible devices already range wildly and the potential is exciting. At the shallow end, there are displays that simply curve around the edge of a traditional rectangular smartphone, as shown by Samsung. Manufacturers could design user interfaces to make use of these spaces as distinct touch control areas for navigation, or as secondary displays for specific information. Imagine a permanent battery meter and signal strength display, or a dedicated notifications area that provides at-a-glance information regardless of your activity or the app that you are in, without detracting from your normal smartphone use. One could easily see a version of Android being brought out to cater for this, using the top, bottom or spine of the phone to deliver notifications.